We are happy to be a part of Paint the Town Pink once again.... Not only have we Pinked up our windows to show our support but we set up a Pink promotion for the entire month of May. All things Pink are 20% off including candles all month long. We also have a little Pink piggy bank up at the register counter if you would like to make a small donation to the Pink Fund. The Pink Fund was set up to provide free mammograms for uninsured and underinsured women in our community. No coupon is needed for our Pink promotion at the store or online. When shopping online your Pink items will show your discount once added to the shopping cart. To make it easier we have set up a special Pink category. It takes a village to achieve the mission of Paint the Town Pink. And, every year, that village has grown with more towns and even more supporters helping us to encourage women, ages 40 and older, to have their annual mammogram. Our annual event merges a breast cancer prevention, detection, and treatment campaign with a fundraising component that raises funds to provide free screening mammography through the Pink Fund for uninsured and underserved women in the community. 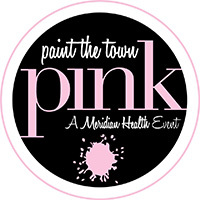 Our Mission: Paint the Town Pink is a community-wide effort to raise awareness of the importance of annual mammography. Our Goals: To encourage women in our community, aged 40 and older, to have their annual mammogram; to raise money to provide underserved women in our community; and to make a difference in the lives of women in our community. Why We Do It: Early detection is a woman’s best defense against breast cancer. A fund designed to provide free mammograms for uninsured and underinsured women in our community. With the expansion of Paint the Town Pink, we have been able to establish a Pink Fund at each of the Meridian Health hospitals. These funds continue to grow with support from our community. If you need a mammogram and you do not have the ability to pay for it through insurance, or other means, please contact one of our Centers (listed below) and a representative will walk you through the process. You will need a prescription from a doctor on our medical staff. During the month of May many businesses and Pink events will display Pink piggy banks or host fundraisers to raise money for the Pink Fund. All money goes directly to the fund and supports women in your community.